I impatiently fumble with the large iron key provided to me by the reception and press my body against the door as I eagerly jiggle the door handle. I am exhausted. After a 12-hour plane ride and a water taxi ride into Venice, I am ready to collapse face forward on my bed. I finally hear the familiar click of the lock and swing the door open. I can't help but let out a small squeal as I drop my items in the middle of the room and throw open the curtains. This can't be my room. I mutter to myself as I pull out my camera to take a picture of the gorgeous Venetian horizon that lies right beyond my fingertips. The view of Venice convinces me to postpone my nap. I jump into the shower, dress and met up with the Monogram's local host downstairs with a map firmly clutched in my hand. My first question is safety. Don't worry, Igor, the local host, says, Venice is one of the safest cities! You can walk around with no problems. He then proceeds to point out various sights on the map before informing me that our tour briefing will be at 6 pm sharp. I step out of Hotel Bonvecchiati and realize that my hotel truly is in the heart of Venice. 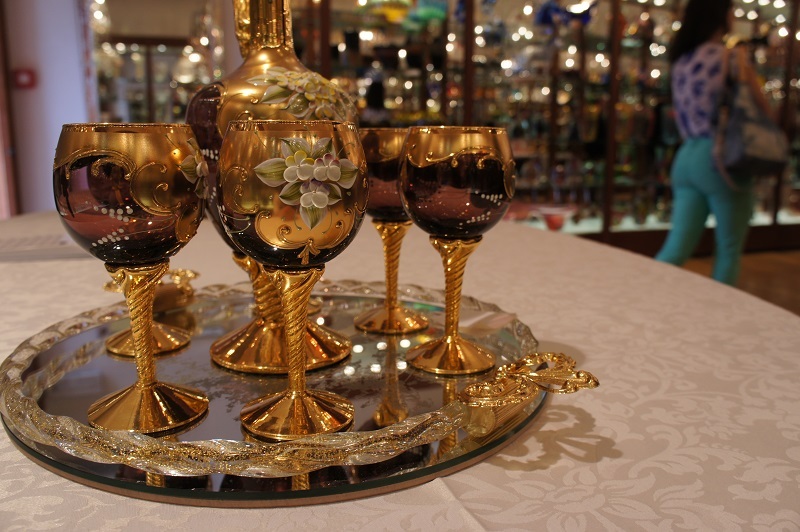 It is a 4-star establishment located walking distance to all major sights, including the famous St Mark's Square. 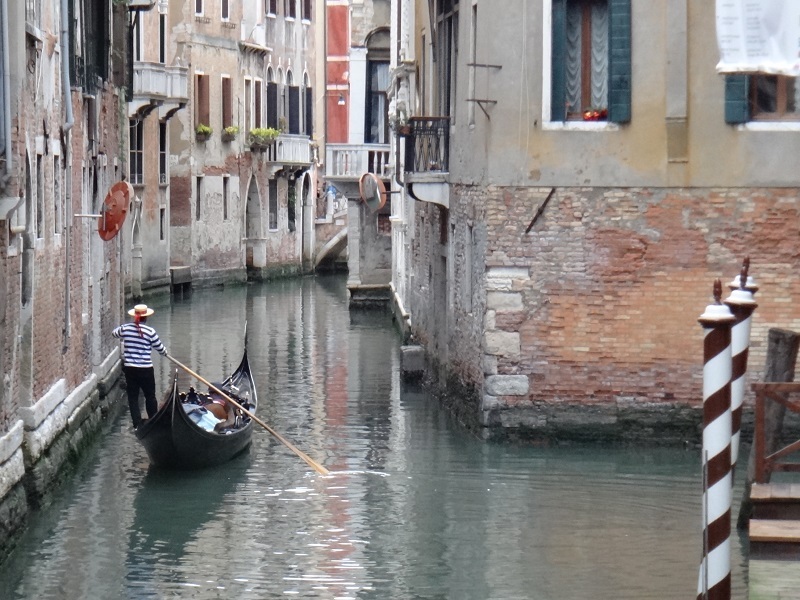 As I walk down the narrow streets, I admire the rows of gondolas. Gondoliers shout at me would you like a ride?! I shake my head politely as I adamantly walk forward until I emerge in the square. Piazza San Marco, also known as St. Mark's Square, is a must-see in Venice but is also always teeming with tourists. The crowd is at its highest point during mid-day so it is advisable to go either early or late in the day to enjoy a less crowded square. The Piazza is known for the great church of St. Mark and the Clock Tower. Just off the Piazza is the Piazetta di San Marco, an adjoining open space connecting the south side of the Piazza to the waterway of the lagoon. There traveler's can explore the Doge's Palace. If you are a history buff, than I highly recommend taking a guided tour; after all this was once the Doge's residence, the seat of government and the palace of justice. This is where some of the most important decisions for Venice's, and even Europe's, destiny were taken. After admiring the surrounding buildings, I decide to get lost. I stuff my map inside my bag and start to walk through the winding streets, climbing bridge after bridge. I am later told that Venice is actually not one island; it is made up of roughly 118 – 120 islands that are all linked by bridges. I find myself at the edge of the city and ask a local about the large boats lined around the edge of the Venetian lagoon. I am informed that the city is made up of a network of vaporetti or water buses which operate around the most important areas of Venice and the surrounding islands. The main ticket office is situated in Piazzale Roma (main bus station) but there are ticket offices/kiosks situated at most major water bus stops. 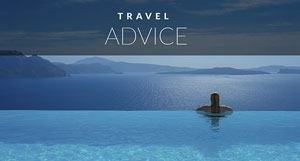 A simple one way ticket costs EUR$7 per person and is valid for 60 minutes. 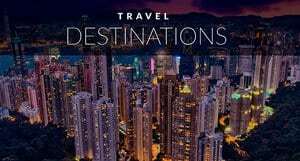 Travelers can also get special travel cards which allow you to take as many water buses as you wish on any routes, within the time consented. The prices range from EUR$18 / 12 hrs to EUR$35 / 72 hrs. I later find myself avidly taking pictures while seated on one of these taxis as our group heads to another popular destination, the islands of Murano and Burano. Murano has been made famous for its glass making and is home to a glass making factory and store while Burano is known for its small, brightly painted houses, popular with artists. 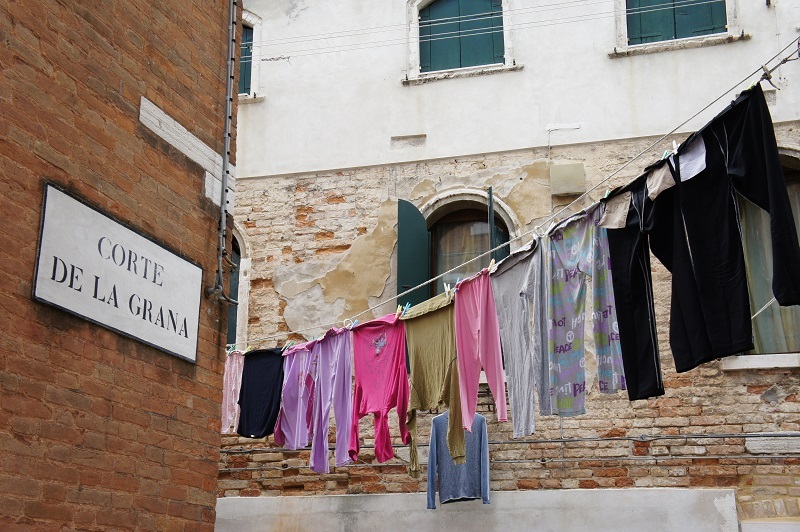 Other attractions on the island of Burano include; the Church of San Martino (with its own leaning tower) and the Museum and School of Lacemaking. 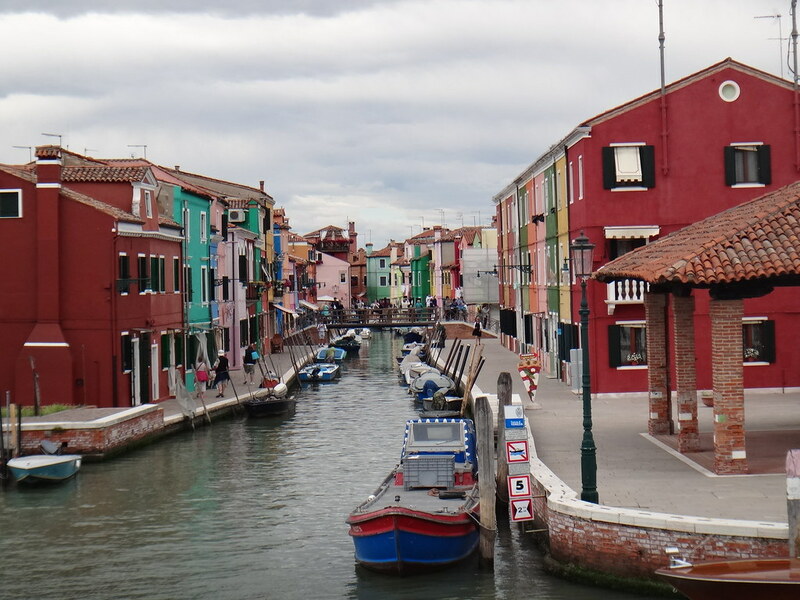 Burano is definitely the place to stock up on lace masks and scarves! When we return to Venice, I am faced with a conundrum: do I enter into Harry's Bar to try one of their famous Bellini's or do I people watch in St. Mark's Square at Italy's oldest coffee house: Caffè Florian? I am told by our local host that the Bellini, made with fresh peach juice and prosecco wine, was invented in Harry's Bar and was often ordered by Ernest Hemingway who frequented this Venetian locale. Igor tells us that the patio view is quite stunning but the price for the Bellini, EUR$25, dissuades me. Instead I opt for Caffe Florian, a coffee house which was established in 1720. My evening is spent relaxing under the waning sun while people watching and sipping a strawberry Bellini (peaches are sadly not in season yet). 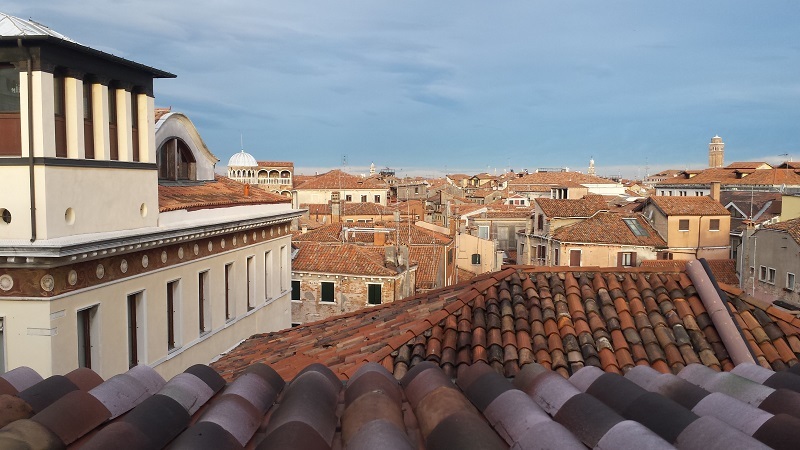 The next day I wake up bright and early to watch the sun rise over the Venetian rooftops from my room. 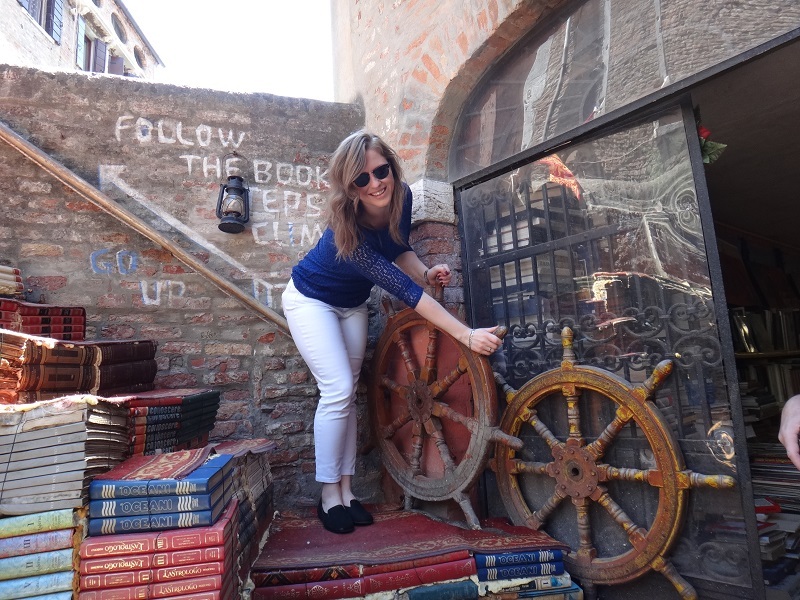 It is my last day in Venice and we end our stay with another small tour around the city, including a stop-over at one of the most beautiful bookshops in the world: Libreria Alta Acqua. We are welcomed by the owner who invites us inside and shows us the full-sized gondola right in the middle of the shop. He motions to the back where I discover a fully functioning staircase made out of books that I clamber over to watch gondoliers ride by. The owner is constantly smiling, no doubt due to the recent article published by the BBC that named this liberia as one of the ten most beautiful bookshops in the world. Our tour ends with a surprise: a gondola serenade. The price may be steep (Before 7 pm: EUR$80 / per gondola OR after 7 pm: EUR$100 / per gondola) but one cannot come to Venice and not enjoy a ride. Did you know that there are 425 gondoliers in Venice and each has a nickname? Unfortunately, ours was surprisingly quiet and only gave us a wink at the end of our ride in an effort to charm us into tipping. 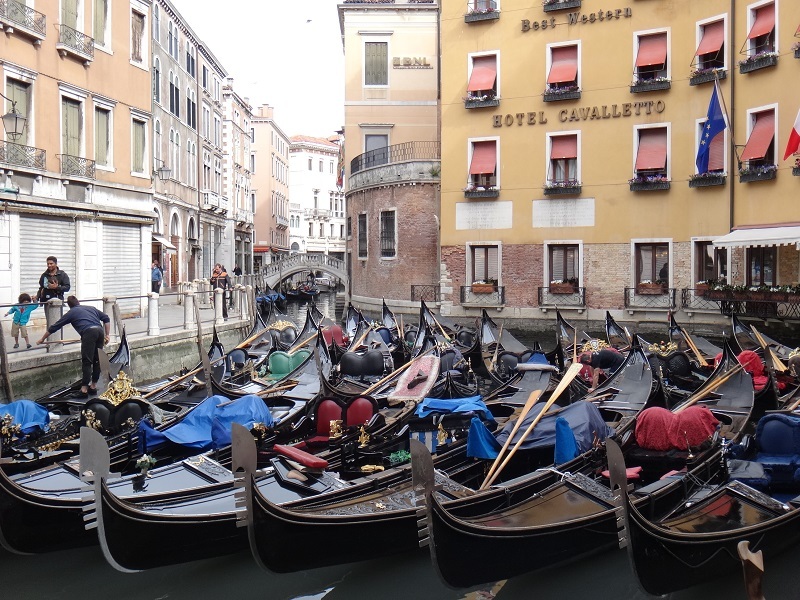 But if you are ever in a gondola, make sure to ask what the gondolier's nickname is! I am helped into the gondola and rest my head against the red cushion. We float effortlessly on the water as the singer belts out a song in Italian. My eyelids feel heavy and I am completely relaxed. Before I know it our 40 minutes are up and I am being helped out of the boat. 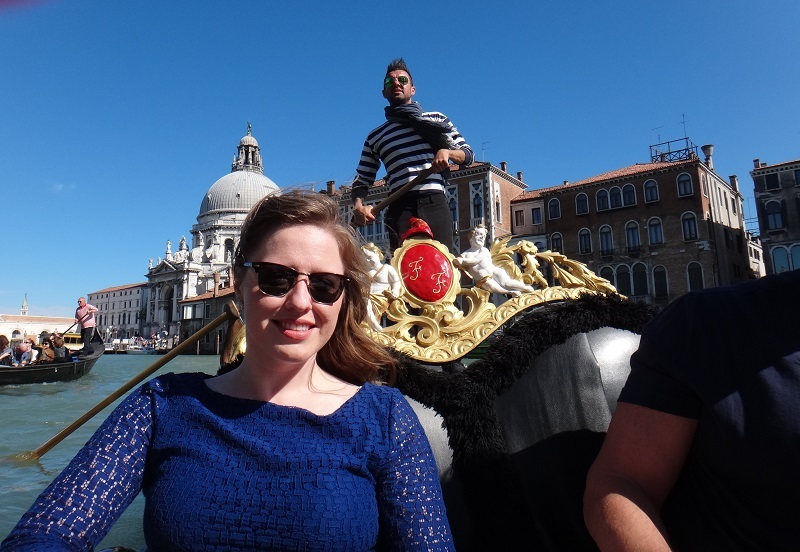 I am told that if you want to be extra romantic while in Venice, you can rent (in advance) an accordion player and a singer for EUR$130 per gondola ride. Is it worth it? Heck ya. We are quickly whisked away to enjoy a mouth-watering meal served at Antico Martini Restaurant established in 1720. The menu is a la carte and I choose prosciutto with melon, gnoccheti, basil encrusted sea bass and apple pie served with prosecco, red wine and finished off with an expresso. As each course arrives our table falls silent as everyone devours all the contents of their plate. The food is so drool-worthy that I contemplate licking my plate clean but decide against it due to the severe judgment I would accrue for my action. Then suddenly, the night is over. I pat my belly in satisfaction as I hobble back to my hotel. I am momentarily disappointed that I did not get the chance to visit the Guggenheim Museum in Venice, but promise that I will one day return. I ask reception for my key, walk up the stairs and glance one more time at the beautiful skyline outside my windowsill before I collapse head first into my bed for a well-needed sleep. That night I dream of Venice. I will be back. 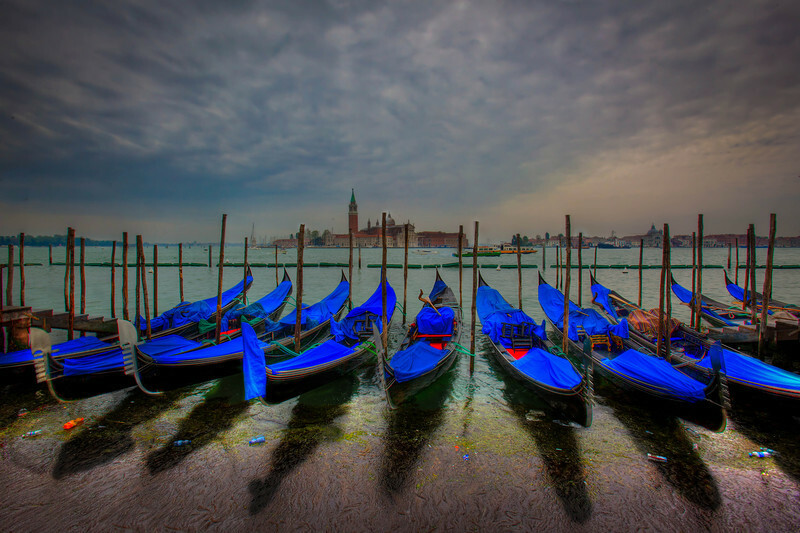 19 Responses to "Venice, Italy: Exploring the Magical City On the Water"
Hi….Venice is Beautiful. I would like to plan this summer with friends. the most important thing i love about Venice is the river between town or town beside river. either both of them are same. I want to go to Venice very badly. Thanks for sharing your experience. I am very jealous. Venice is really magical, was there long time ago but now, seeing your article, I’m very tempted to go again!! Great post, great pictures! Keep it up! We agree. I think I could always keep going back to Paris. Venice is so beautiful, definitely one of the best cities in the world. Love your pictures. Thanks for sharing. I live in Slovakia and it is just few hour by car to Venice (much less than 12 hour in a plane). During the carnival, slovak travel agencies make a day trip to Venice and back to Slovakia for 50 euros. It is really nice one day experience. Venice are so beautiful. Thanks for this article and nice pictures. 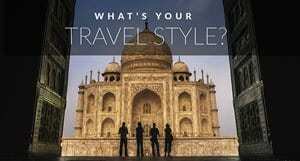 hi…its awesome city and beautiful place,,,,,,,good creativity…i intersted this travel and enjoy this magical city….. I love all things Venice. Did you try a spritz whilst you were there? Absolutely delicious but then again the strawberry Bellini sounds equally good. We tried many a spritz when we were there. Our favourite things was to watch the tour buses and cruise ship passengers come in in the middle of the day. They’d be running around and we’d spend that time sitting on a terrace watching them all. I love that Monograms has their guests stay in Venice. 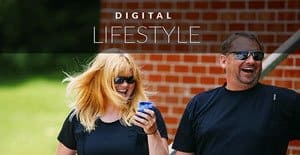 It lets you get a taste of the real city. We had a spritz or two when we were there. I loved sitting on the water watching the tourists go by in mid afternoon. When the cruises and tour busses came in, that’s when we sat down, had lunch and drank a spritz. Staying in the city was amazing, because once everyone left, we could walk around without the crowds. Great suggestion of the vaporetto. Just getting out on the canals is worth it any way that you can. We did a couple of hours in a private taxi with Walks of Italy when we were there. It was amazing. Yes you are right Ahsan. It is so safe in Venice that you can easily just wander the streets during the night and discover the magic of Venice. I was in Venice last month. Probably the best thing to do as you did was to fold the map and get lost in the city. I did that at midnight and absolutely loved the magic of Venice at night. Agreed, walking around in the middle of the night was a highlight for us. Nobody is around. I absolutely loved Venice! It is the most beautiful magical city.